I am Arwen, the Inspirer (ENFP). This certainly works for me. Although, I, too, am becoming more I than E as I grow older. What a wonderfully appropriate type for an educator! Interesting! Apparently I’m a Galadriel then, though I completely agree our personalities are evolving – and so too did the characters from the LOTR evolve. Frodo for example seemed less of an idealist by the end, there was a resigned determination but also quite a bit of despair – where would that place him? I liked Gandalf’s personality description, that sums him up well! That’s true… they did change, and not just by “maturing.” Their journey left them indelibly different. As to your question about Frodo… he did lose much of that idealism, didn’t he? I suppose he drifted over into the philosopher category with his mentor Gandalf. That would fit him well as he sailed to the Undying Lands. I’m an ENTJ too. I think the best book on that system is “I’m Not Crazy, I’m Just Not You” by two of the people who helped develop the MBTI. It has charts in which you can look up someone’s demeanor, and their pet peeves, and find out what they are probably thinking. It helped me understand people much better. Apparently, feelers feel the same way about facts as thinkers do about feelings — they have them but aren’t comfortable relying on them. It also tells you how you appear to people who are different. Oh, and the list could be extended, but this is probably sufficient. I’m not obstinate, I’ve just seen what happens when I fail to hold my ground. I’m not pushy, I’ve just been given the runaround too often. I’m not insensitive, I just don’t read minds. I’m not critical, except when it’s too good to pass up. That just happens a lot. I’m not rigid, I think I compromise more than most people, they just don’t remember what my starting point was. I’m not inflexible, I’m actually extremely adaptable, but when I know someone is trying to play me with an appeal to flexibility or curiosity I want to know their true intentions. I’m not a know-it-all, I’m a know-what-I-know. When I don’t know something, I generally admit it. If the other person also doesn’t know, however, I go find out who does, instead of assuming the question is unanswerable. That good. If you’re not perceived by others as any of those things perhaps you’re not really ENTJ? By the way, I share all of your self-descriptions there. 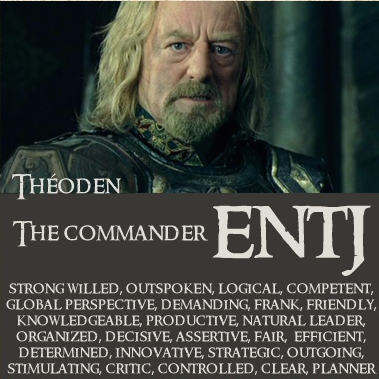 Lo, I am Faramir (ENFJ) and no truer words could be spoken of me. Fascinating post. Nicely done. Helpful for all. P.S. I read the weaknesses of the ENFJ and wholeheartedly that is me as well. 😐 Trying to achieve balance—ever the human struggle. But defining them as this helps to achieve that. Faramir is a wonderful hero, and ENFJs offer wonderful attributes to their family, team or community. Yes, we all have the flip side of our personality coins though, don’t we? This all makes me wonder what our personalities will be like in heaven… without the negative aspects. We will be, for the first time ever, our true selves. And that will certainly be a sight to see! Haha, I was relieved to be Faramir. One of my favorites to be sure. The closer I get to heaven, may I exemplify the strengths even more. I’ve learned to overcome many of the weaknesses but here on earth it’s still a process. It’s a wondrous thought to ponder that we will be our true selves in heaven. May it be so! All the types have a dark side and a light side. None are better than others. I have looked at personality forums and was turned off by the general attitude of putting other types down. That’s why I like “I’m Not Crazy.” It shows how someone who sees me as pushy comes to that conclusion, when I feel it’s agonizing to watch some people shy away from making decisions. Like trying to go to a mall on a bus with someone who is apparently willing to miss four buses while discussing every possible way to get there, so we have to wait for a second round of buses, and the person then wanders away and pays attention to a third party, who may or may not want to talk all day, while I designed my day off around this trip. If I give an ultimatum — “We’re getting on the next Number 55 or I’m going without you” — the other person gets hurt feelings for, apparently, the rest of their life. I just want to go to the mall, and I just happen to have been in this space-time continuum long enough to know my time is limited on earth. I just want to know if we’re going or not while I can still salvage my day off. There is nothing personal about it. I was going to see the whole mall and get the three best bargains by five pm. One was going to be a gift for the person who went with me. They missed it. I don’t feel responsible for their hurt feelings at all. However, I do get concerned and curious about why they did that in the first place and what they took offense at. That’s why type theory is interesting to me. I can just see the irony settling slowly all around his feet. I’m INTJ, so I would be Elrond. I can handle that. No, I don’t think it would be pleasant to be with Agent Smith. In response to your question, I can’t say I’ve ever heard anyone describe Myers-Briggs as magic. That said, I can’t attest to which is more accurate. What can I say beyond, geegolly? “While instructive, tools such as this should never be used to put people into boxes (which is ironic, since the MBTI is graphically presented in that fashion). Absofrigginloutly. It’s a tool, and as Lewis would say, no doubt, if it doesn’t help, cast it aside. I believe that if, in your heart, you’re a hobbit or dwarf that they would respect that and grant you honorary status. I don’t know enough about the inventory to understand the dynamics of a T>P shift. As you say, it followed a crisis. Those episodes surely precipitate many transitions in our lives, don’t they? The crisis was simple enough, on the face of it (though anything but simple to go through). I pushed my ability to reason to its limits and found that, instead of answers, I had a blind choice. Prior to that, I held up logic as the only true guide to life, a false god I suppose, and felt that emotional people were completely irrational. I now believe that there is more than one way of knowing/learning/reasoning, and it’s best to use them all in their right contexts. Logic as an idol… yes, we human beings can make anything into an object of worship, can’t we? There certainly are different contexts where different approaches to problem-solving, etc. demand to be applied.